I have other posts many with video clips an the Massacre in Andijan here, here, here, here, and here. 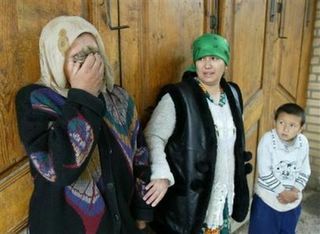 “Uzbek police and security forces may have killed as many as 1,000 unarmed civilians in Andijan and Pakhtaabad, using machine guns, other automatic weapons and helicopters, according to independent journalists and local human rights organizations,” the International Helsinki Federation for Human Rights said in a statement. The federation, which groups 44 non-governmental rights groups, said another 2,000 people were injured in the clampdown and others were being harassed by the authorities. The Arrest of the Horseback Rebel. Gulchikra Rahkimova, the wife of Bakhtiyor Rakhimov, who had proclaimed an Islamic state in the village of Korasuv, tells of his arrest as her family looks on. “Today, between 4 and 5 a.m., some 30 armed people came to Bakhtiyor’s house. I think they were either soldiers or special forces. All of them had machine-guns. There were some thirty people. I didn’t count. I saw them in the window. They fired one shot. I looked and saw young men walking slowly like in movies,” Rakhimova said. Rakhimova told RFE/RL that soldiers did not show any arrest warrant. She said they beat her brother before taking him away. Uzbekistan’s President Islam Karimov said he opposes an international investigation into the worst violence since the country’s independence in 1991, U.N. Secretary-General Kofi Annan said Thursday. “He said he had the situation under control and was taking every measure to bring those responsible to account and didn’t need an international team to establish the facts,” Annan told The Associated Press Thursday night. Karimov’s government has denied that troops fired at civilians, and Karimov blamed Islamic militants for the unrest. The government says 169 people died in Andijan, but opposition activists say more than 700 were killed — over 500 in Andijan and about 200 in nearby Pakhtabad — most of them civilians. Annan spoke with Karimov on the telephone Thursday morning to discuss the situation in Andijan and later reported that the Uzbek leader told him of his oppostion to any international probe of the violence. U.N. spokesman Fred Eckhard said Annan also discussed the Andijan situation with U.S. Secretary of State Condoleezza Rice on Wednesday. A senior U.N. official, who spoke on condition of anonymity, said the secretary-general met Thursday afternoon with acting U.S. Ambassador Anne Patterson. The U.S. State Department has said it was “deeply disturbed” by reports that Uzbek authorities fired at demonstrators, and called for political reform in Uzbekistan. 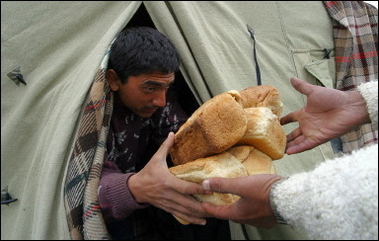 Receiving bread at a makeshift refugee camp in Kyrgyzstan. A common view of experts at the briefing was that the Karimov government needs to move quickly to address the root causes of the Andijon prison seizure. Ambassador Samuel Zbogar of Slovenia, representing the chairman of the Organization for Security and Cooperation in Europe, said Karimov should enlist international support in reforming police and justice structures. 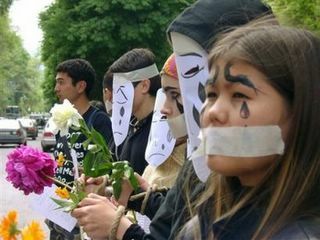 He also urged an end to the media blackout on events in eastern Uzbekistan. Martha Brill Olcott, a Central Asia expert at the Carnegie Endowment for International Peace, said Karimov should permit an international commission to investigate the events in Andijon. But she acknowledged it will be difficult to get his regime’s approval. 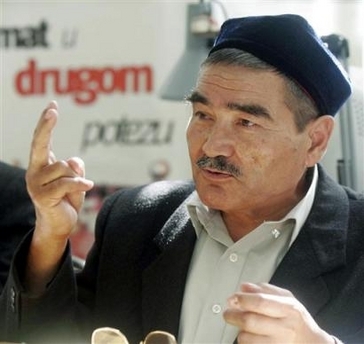 Uzbek Human Rights Activist Talib Yakubov, talks with reporters in Vienna. Natham at the Registan was interviewed by the BBC for his Central Asia expertise. He has much more to say on the crisis. Publius Pundit has been following the story as has Ben Paarman at Thinking East. Hey Dude Whoa is still getting emails from his friend in Uzbekistan who talks about the makings of a news blackout.